Volcano Watch: Why are HVO scientists talking so much about Mauna Loa? 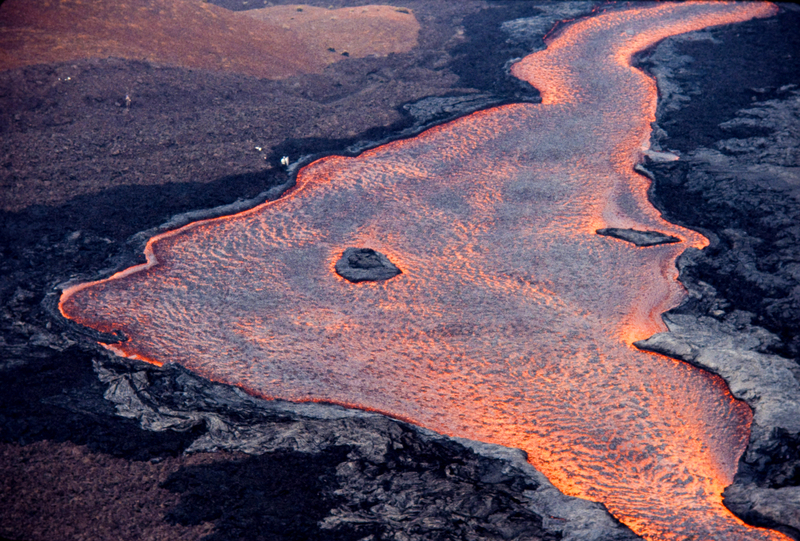 In recent weeks, the USGS Hawaiian Volcano Observatory (HVO) joined forces with several other agencies to talk about Mauna Loa at community events and other public meetings. Unfortunately, some information presented at these gatherings has been misinterpreted. So, we take this opportunity to explain why HVO is talking so much about a volcano that hasn’t erupted in more than three decades, and to clarify a few facts. In 2013-2014, HVO started seeing more earthquakes and an increase in swelling at Mauna Loa. By September 2015, this unrest—indicators of magma on the move—was persistent enough for HVO to change the Volcano Alert Level for Mauna Loa from “normal” to “advisory.” However, this alert level does not mean that a Mauna Loa eruption will happen in the near future. Mauna Loa’s earthquake and swelling rates have slowed in recent months, but they are still above the pre-2013 rates and could increase again. So, for now, the volcano’s alert level remains at “advisory” (defined at volcanoes.usgs.gov/vhp/notific…). Population on the Island of Hawaiʻi has essentially doubled since Mauna Loa’s most recent eruption in 1984—almost 34 years ago. So, a generation of kama‘aina (Hawaii born residents), as well as numerous malihini (island newcomers), have not experienced a Mauna Loa eruption, which can produce large, fast-moving ‘a‘ā flows. Consider these examples: During the 1984 eruption, Mauna Loa erupted in about 20 minutes the same volume of lava that Kīlauea erupts, on average, in one day. A 1950 Mauna Loa lava flow traveled 21 km (13 mi) from its Southwest Rift Zone to the South Kona coast in just over 3 hours. In contrast, the 2014 Kīlauea lava flow that threatened Pāhoa took four months to travel a similar distance. So, experiencing Kīlauea pāhoehoe flows does not necessarily prepare us for Mauna Loa ‘a‘ā flows. Mauna Loa, Earth’s largest active volcano, has erupted 33 times since 1843, producing the lava flows shown in black. All of these historic eruptions started at the summit of the volcano. From there, the eruptions either stayed in the summit area or migrated down the volcano’s Northeast or Southwest Rift Zones. 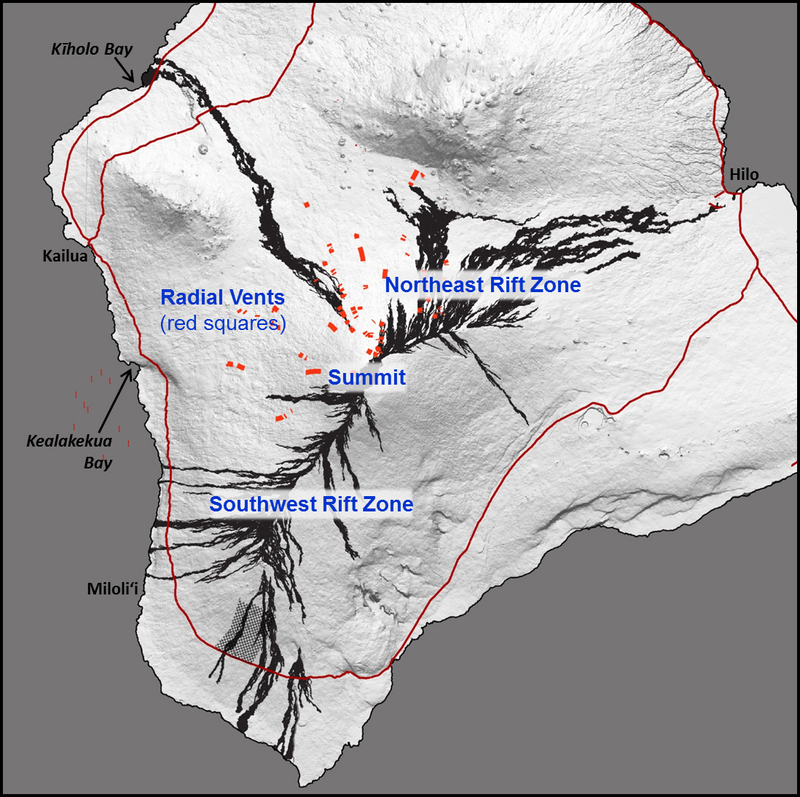 Some Mauna Loa eruptions occurred at radial vents, indicated by red squares, scattered across the north and west flanks of the volcano. Given the volcano’s past eruptions and recent unrest, it’s wise to talk about Mauna Loa now—well before an eruption is about to happen. Thus, we are informing residents about the eruptive history, hazards, and current status of Earth’s largest active volcano. Our challenge is to increase awareness of Mauna Loa and how to prepare for a future eruption without creating unnecessary anxiety. With that in mind, here are some facts about the volcano. Mauna Loa, which covers more than half Hawaiʻi Island’s surface area, is an active volcano that has erupted 33 times since 1843. It will erupt again, but exactly when is not yet known. All 33 eruptions since 1843 started at the summit of Mauna Loa. About half of those eruptions began at the summit, stayed in the summit area, and posed no threat other than increased vog. About 24 percent started at Mauna Loa’s summit and then migrated down the volcano’s Northeast Rift Zone. Eruptions along this rift zone produce flows that could advance toward Hilo, as happened in 1984, but the slopes are gentle enough that it typically takes weeks to months for lava to reach the island’s east coast. Around 21 percent started at the summit then migrated to lower elevations along Mauna Loa’s Southwest Rift Zone. With steep slopes on both sides of this rift zone, lava flows can reach the ocean in a matter of hours to days. Fast-moving ‘a‘ā flows reached the South Kona coast in 3-18 hours in 1950, 24 hours in 1919, and 4 days in 1926. The remaining Mauna Loa eruptions are from radial vents on the volcano’s north and west flanks. In 1859, an eruption from a radial vent at 11,000 feet elevation sent an ‘a‘ā flow to the coast in eight days. We hope Hawaiʻi residents will become more aware of Mauna Loa and how they can prepare for the volcano’s next eruption without fear or panic. Updates and monitoring data for Mauna Loa are posted on HVO’s website (volcanoes.usgs.gov/volcanoes/m…). Guidance on preparing a family emergency plan for natural hazards, including eruptions, is available from Hawaiʻi County Civil Defense (www.hawaiicounty.gov/civil-def…). HVO does not expect Mauna Loa to erupt in the near future. However, we continue to closely monitor the volcano and will notify authorities and island residents of any changes.